Years of Military Relocation experience Makes Us Your Go To Real Estate Brokerage. 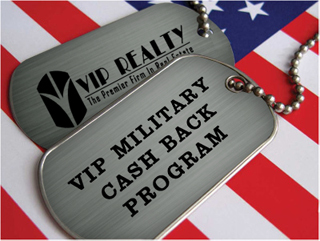 Fill out the form below to enroll in our Military Cash Back Program! Contact us anytime for more information! Dallas VA real estate is highly sought-after because of its affordability when compared to other southern cities. Within Dallas are distinctive neighborhoods, high-rise buildings designed to impress, and master-planned communities with loads of community amenities. Dallas VA home loans have allowed both active and retired military personnel to enjoy the many advantages of home ownership with the benefits of a VA loan. Just some of the advantages of securing Dallas VA home loans are: a competitive interest rate; no down payment; no private mortgage insurance, and less-stringent guidelines than traditional mortgages. Securing Dallas VA home loans are a popular choice for military personnel who work at the Naval Air Station Fort Worth Joint Reserve in nearby Fort Worth, and are a popular alternative to conventional home loans. VIP Realty and our team of qualified agents have extensive knowledge in the Dallas real estate market, and we are prepared to help you locate Dallas VA homes for sale and Dallas VA real estate that best meet your needs, wants and budget.